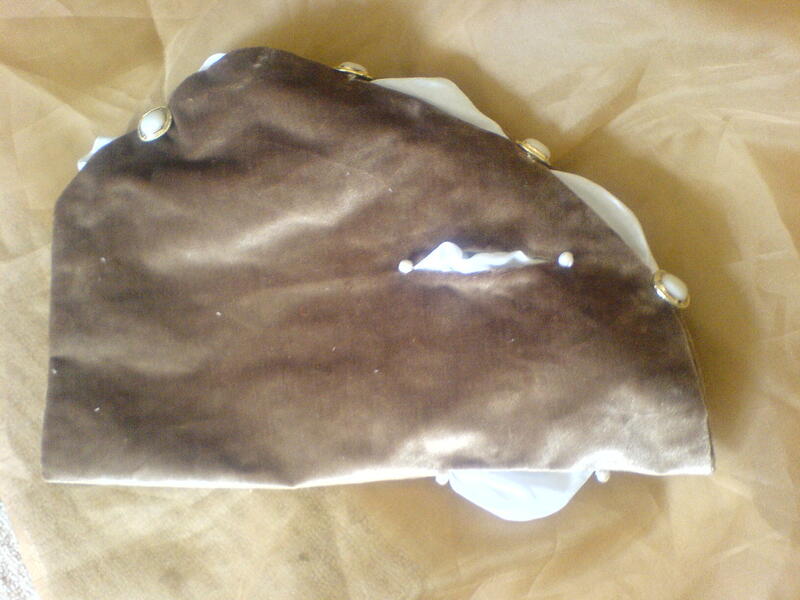 I set my hear on a bodice based on the pattern in Norah Waugh book. 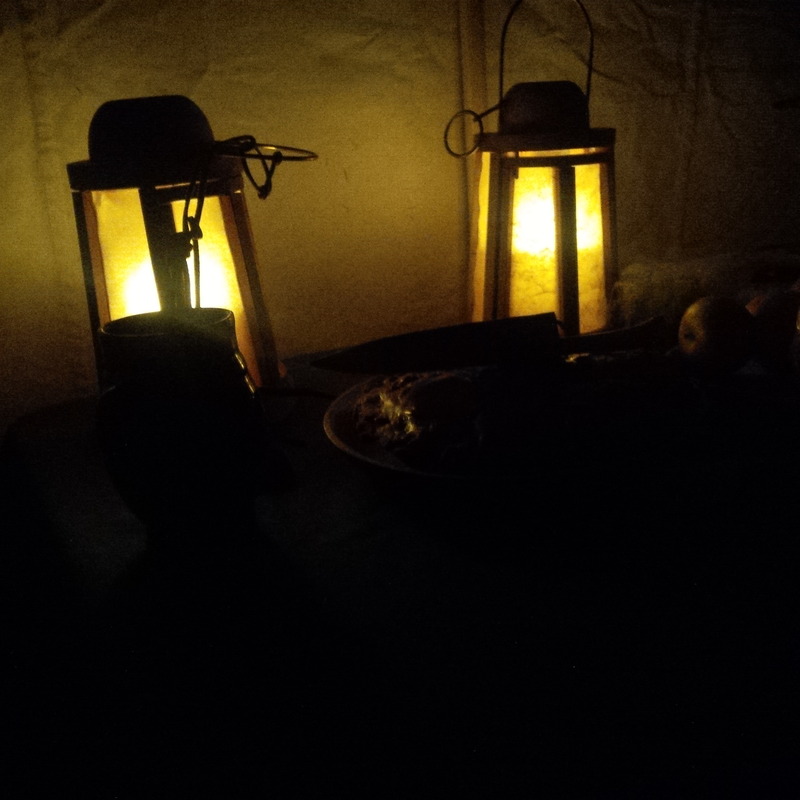 materials were olive wool and mustard linen lining, with plain linen foundation. Altogether I was very please with how the pattern worked – and it was relatively easy to put the things together – the most troublesome part was getting all the layers in the armhole working correctly – there are 4 layers: sleeve, oversleeve, the wing, and the bodice – so rather a lot! I wore the bodice without stays, but found it was not boned sufficiently to support my bosom or my back ( 7 hours sitting and making lace does make your back ache,…), but when worn over a bodiced petticoat, it worked great! 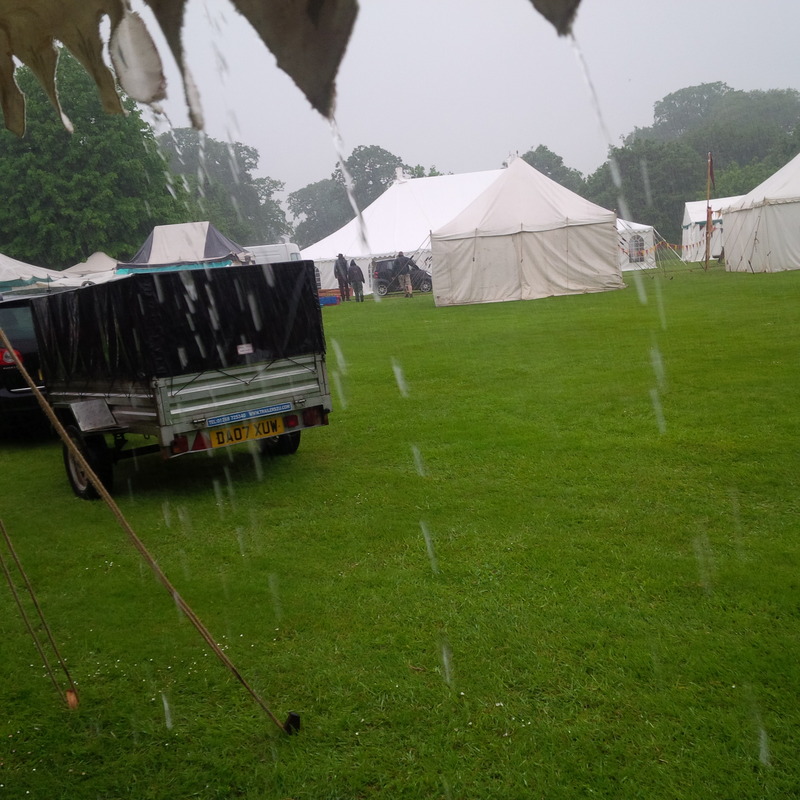 after the wet beginning, the weather was fine – warm, sunny and perfect for being outside, enjoying the fantastic surroundings, during the day we were both busy ( we were told there was on average over a 1000 people visiting each day! 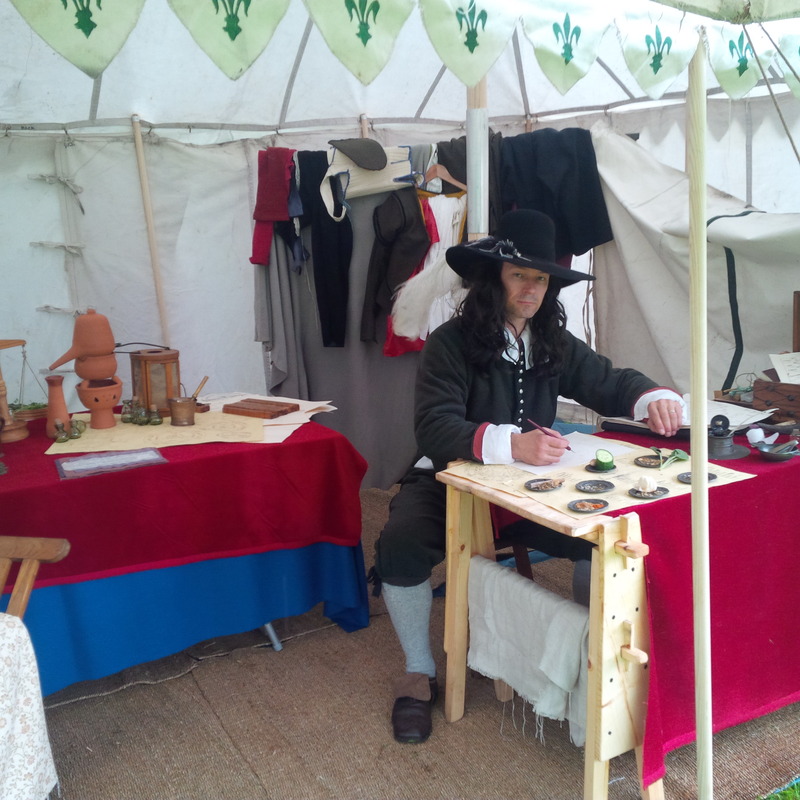 ), but even from our tent we could see the falconry display, shows, arming the knight and equestrian shows. 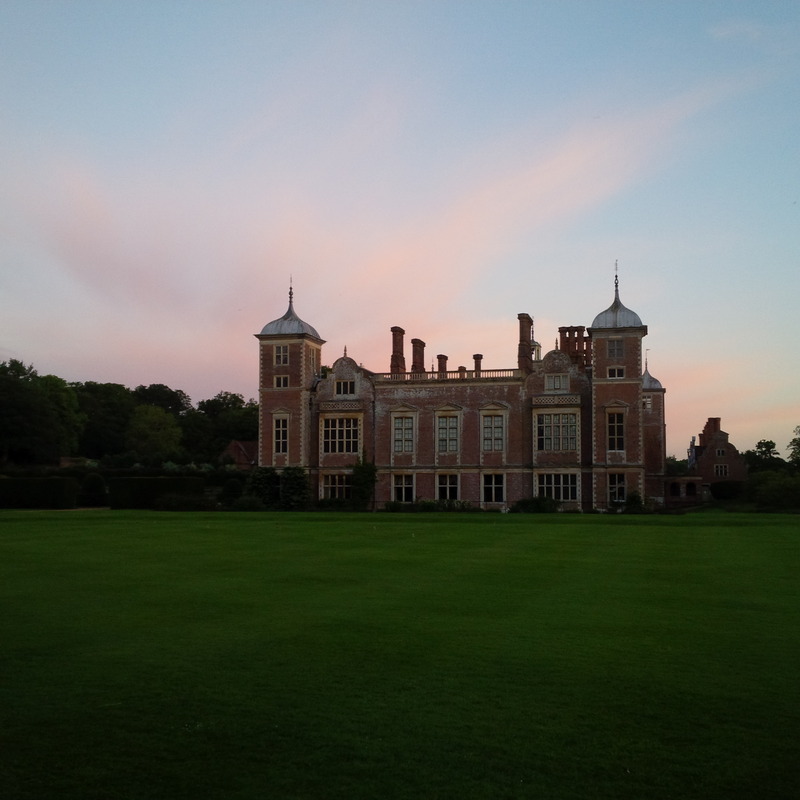 after the public was gone, we took photos – and walked around the grounds – a truly fantastic place! the organizer, praying up for some smashing weather no doubt – successfully so too! Graham looking a bit scary…. and that’s all folks! 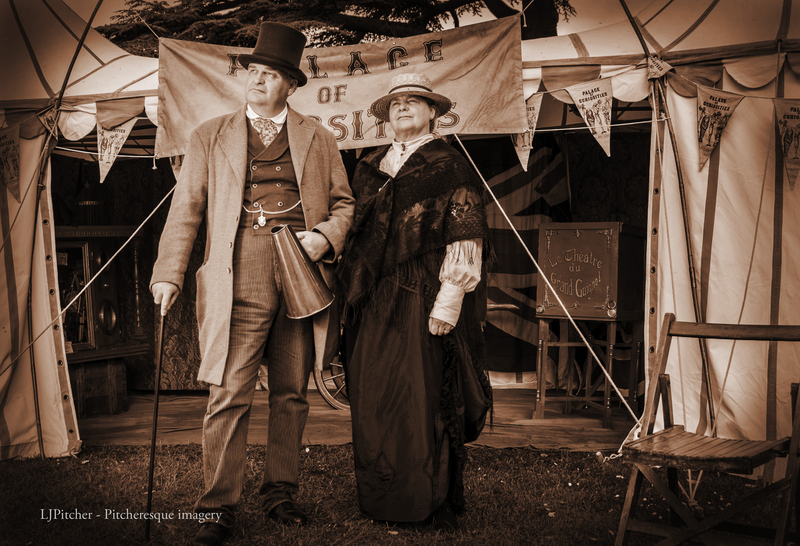 more photos on Lucas’ photography page – Pitcheresque Imagery. 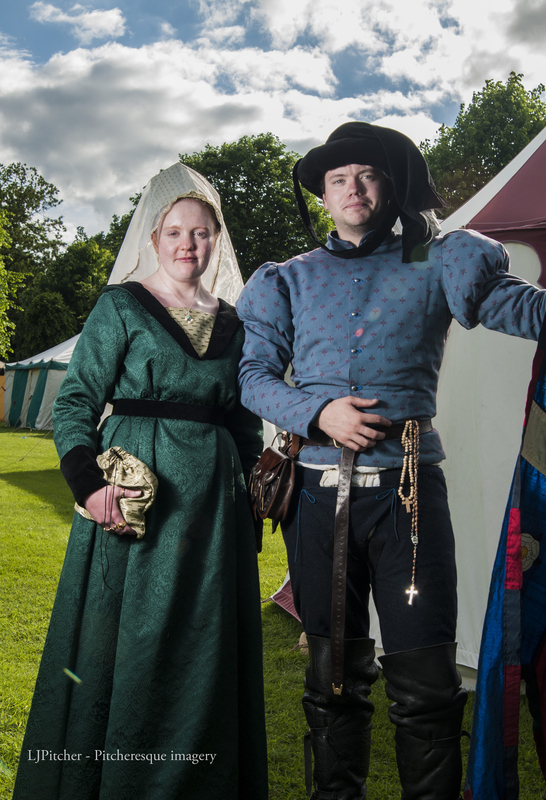 With the Tudors recently enjoying such popularity, the demand for Tudor clothing has been high – after all, the clothes are very flattering for all figures and the period fabric are simply sumptuous. 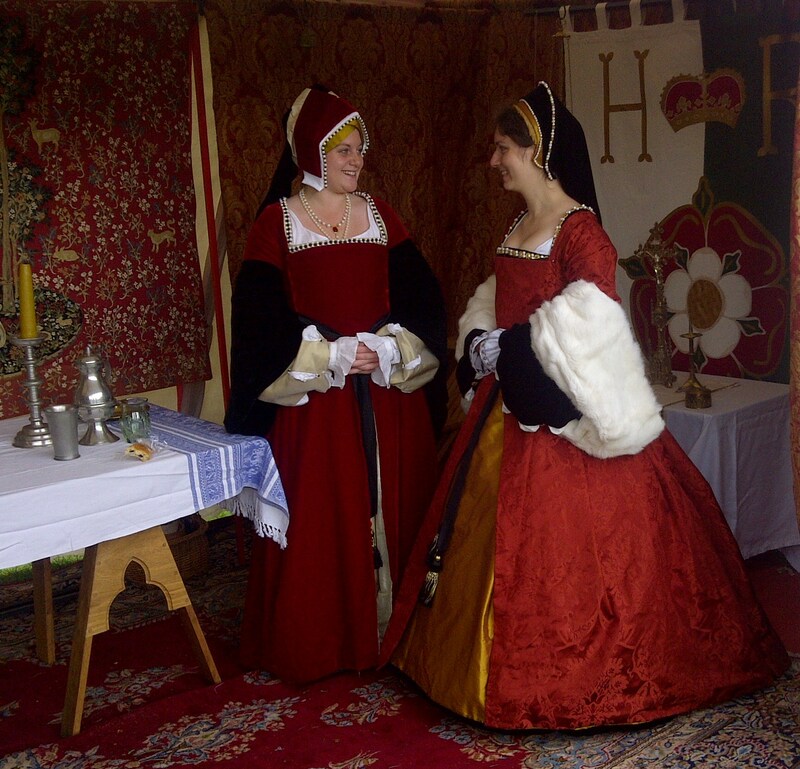 As a result, I have been working on several Tudor projects in the last few years and have repeatedly been asked for hints and advice on making the garments. 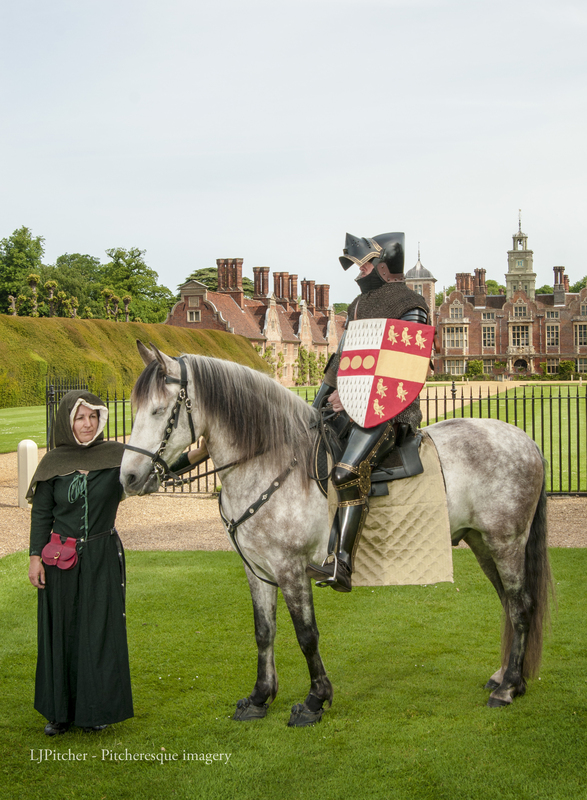 In this article I will discuss the making of a kirtle and a gown suitable for a Henrician lady at around 1530 – 40. Partlet – either a linen neckerchief, often decorated with embroidery, or made in silks, wool and sometimes fur (particularly for later styles). I will concentrate mainly on the instructions how to make a bodiced kirtle and a trained gown, specifying fabrics and techniques used, and presenting the process step by step using illustrations to show the details. 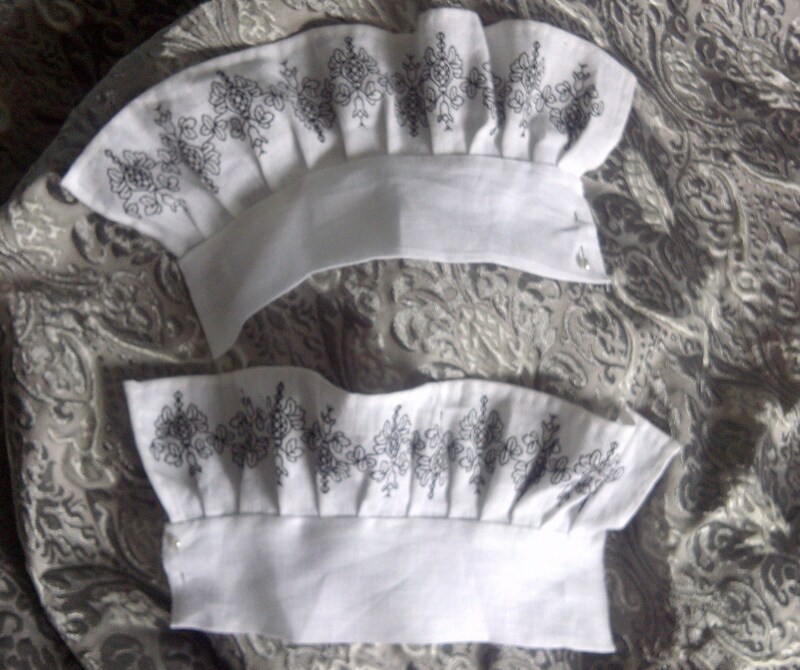 I will also briefly discuss sleeves, cuffs and girdles, and the detailed instructions how to make a gable and a French hood will be covered in a separate article. 4-6m of silk taffeta for top fabric (good quality wool can be used for middle/upper class attire; silks for higher classes, including damasks and jacquards. The patterns shown in The Tudor Tailor book and sold online (http://www.tudortailor.com/patternshop.shtml ) work very well, though adjustments will be necessary for different types of figure – I always make a mock up to check the fit. Cut the pattern pieces for the bodice in calico. 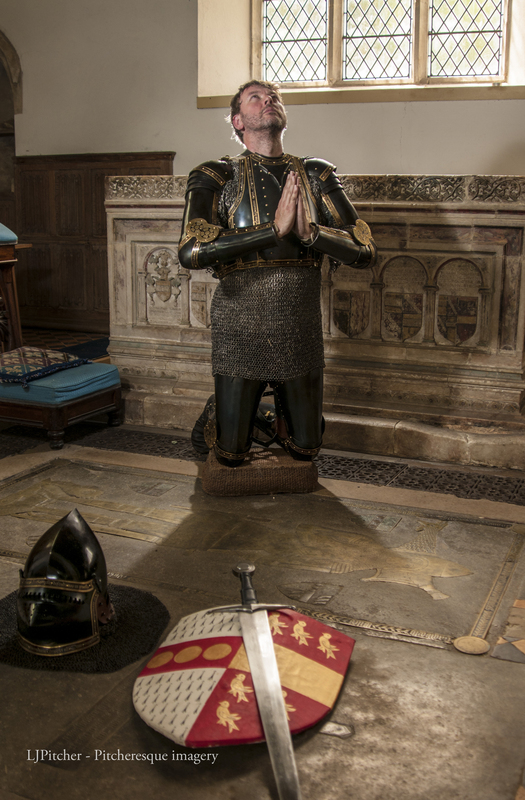 For fuller figures, it often helps to cut the front piece in buckram or even stiff paper to see how the stiffened front will look, however, to get the best results, bone your mock up as you would the kirtle. Stitch the pieces together and try on. Adjust if necessary and mark the changes on your pattern. 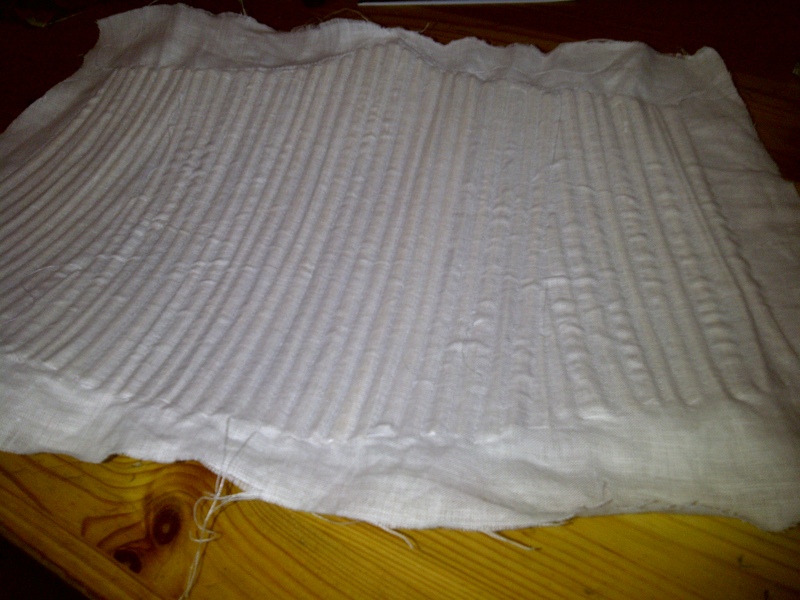 Cut the front piece in linen – 2 layers. Sew the channels – either by machine or by hand (small running stitch or backstitch work best). Baste the back pieces of the calico mock up to the front piece. Stitch a readymade lacing strip to the back pieces- it is only a temporary measure used for the fitting. Insert boning and try the bodice on, carefully checking if the boning is of correct length, and mark the position of the shoulder straps on the front piece. 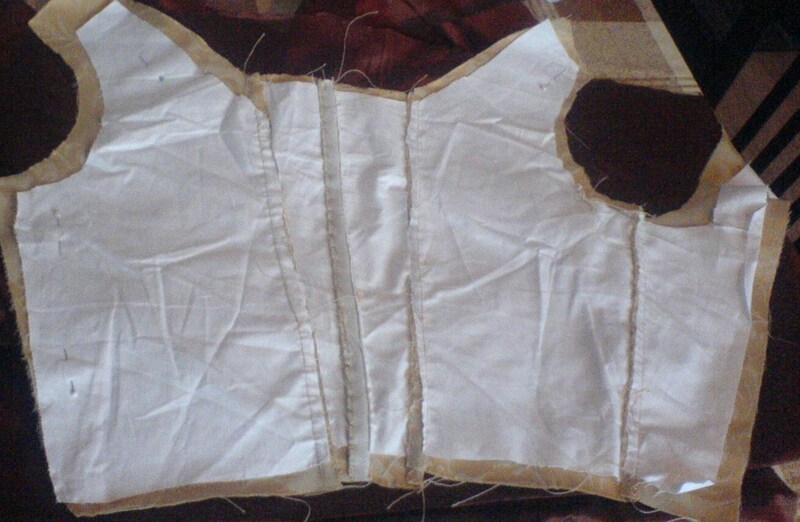 If everything fits well, take the bodice off; remove the lacing strips and the boning. You can use the mock up pieces as an interlining. Cut the pieces in top fabric and lining. 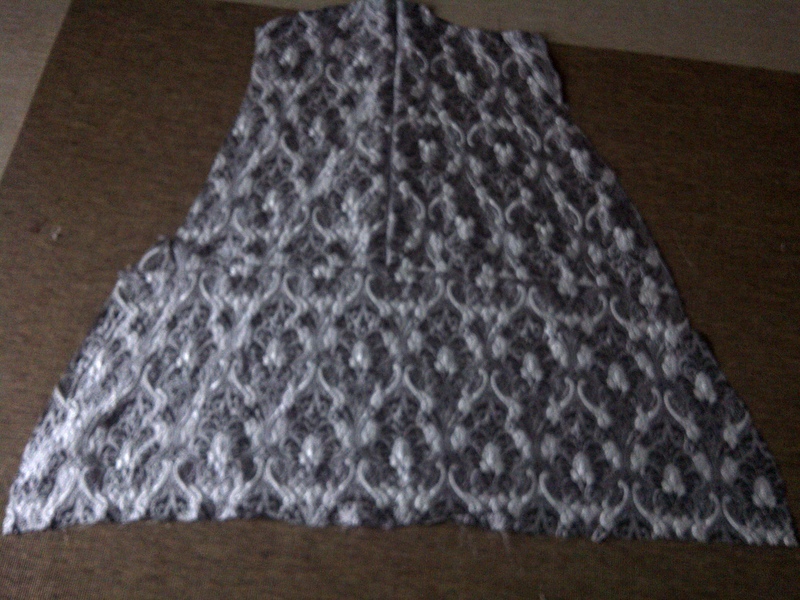 Lay the top fabric on the boned front piece and baste it together. Place the back pieces (top fabric plus interlining) on the front piece, right sides together and sew. 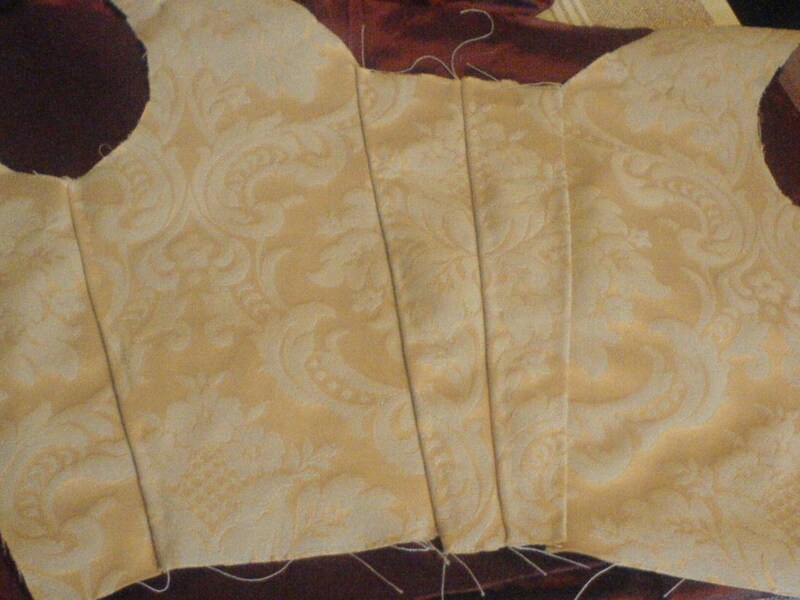 You should now have all the bodice pieces together. If you plan to bone the back pieces to make lacing more durable, do it now. Secure the shoulder strips to the front piece. If your neckline is gaping, sew a narrow bias cut tape or strip of fabric around the neckline, stitch it down and insert a narrow braid. When pulled tighter, the braid will pull the neckline closer (see The Tudor Tailor for details). 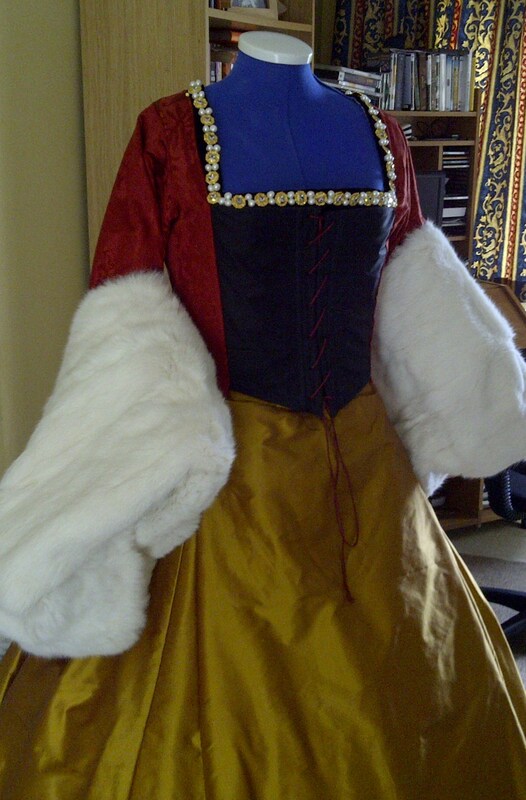 This step is not always necessary, on some figures the kirtle top sits nicely and snug without the additional incentive! If you plan to use a more decorative fabric to border the neckline, do it now. Simply cut pieces of fabric and stitch carefully to the neckline. You can now add any decoration or jewels. You can stitch them onto the decorative border or simply on the top fabric. Lining: stitch the back pieces to the front piece in the same way as you did the top fabric. Pin the lining into the bodice, and stitch around the edges using a slip stitch – make sure the lining covers any stitches from applying the decoration. 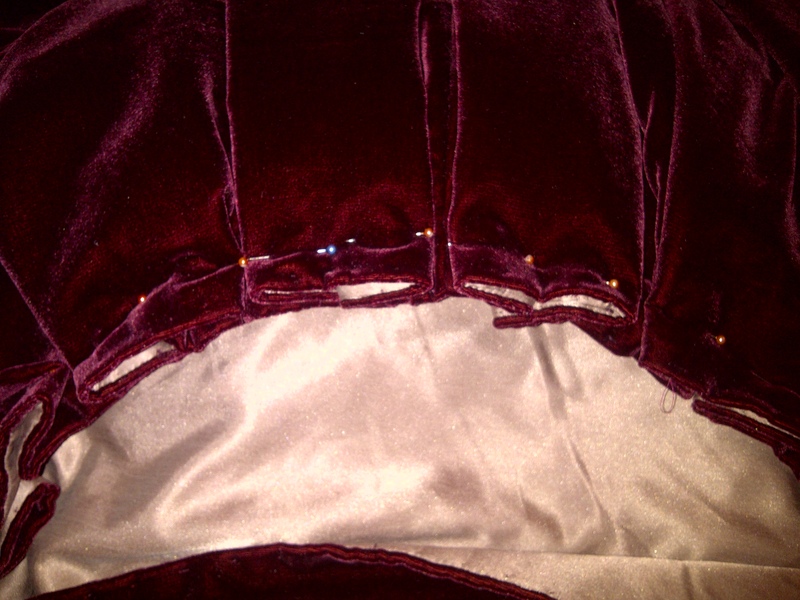 Do not stitch the lining to the bottom of the bodice, but pin it slightly up, out of the way. 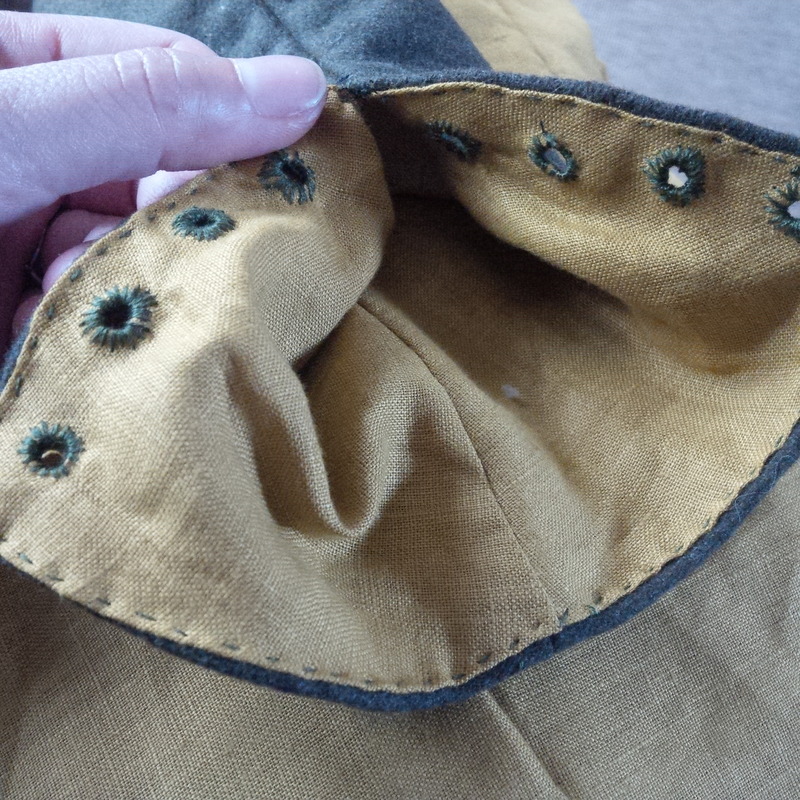 Work the eyelets at the back – use an awl and take care not to damage the fabric. Work the eyelets in linen or strong silk thread. The skirts can be either even or trained. 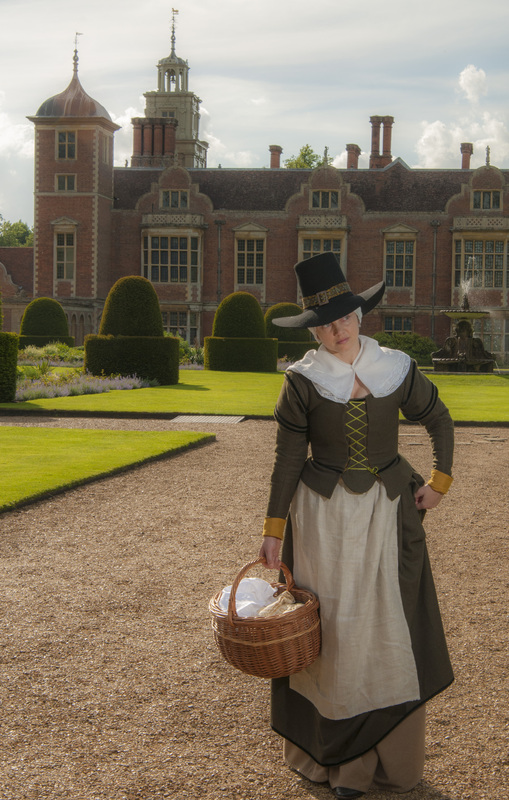 If you plan to wear your kirtle over a farthingale, make sure you measure for the kirtle on the farthingale – it will need to be longer! 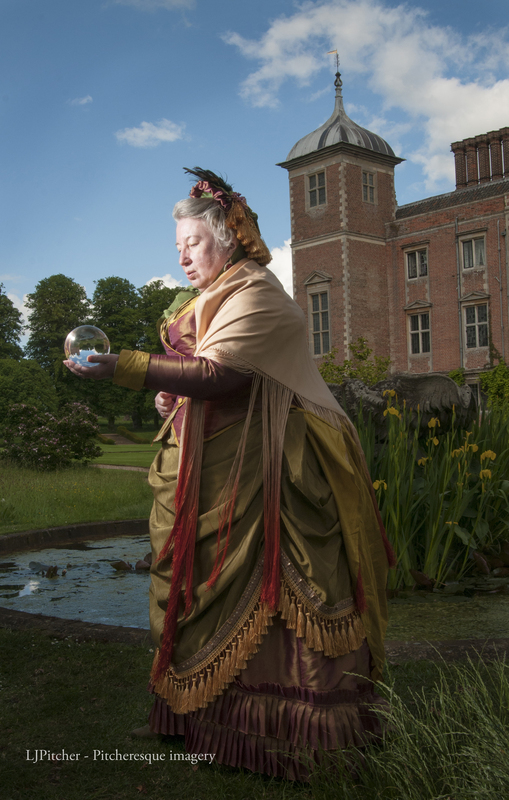 It is always a good idea to make the skirts voluminous and long enough to be worn on a farthingale – it is easier to make one that can be adaptable to both styles. Cut out your pieces in top fabric and lining. If you are using more decorative fabric on the front and hem of the skirts, you will need to piece them first. 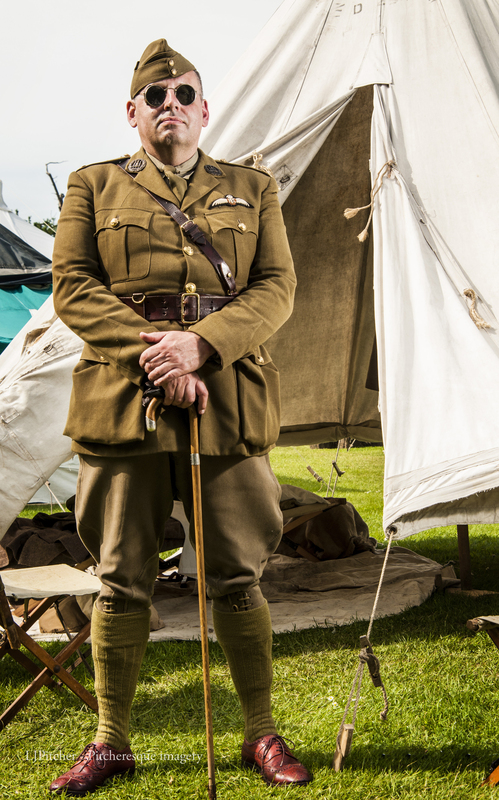 It is advisable to interline the front panel – especially if your fabrics are light. Stitch the top fabric pieces together to form one layer. 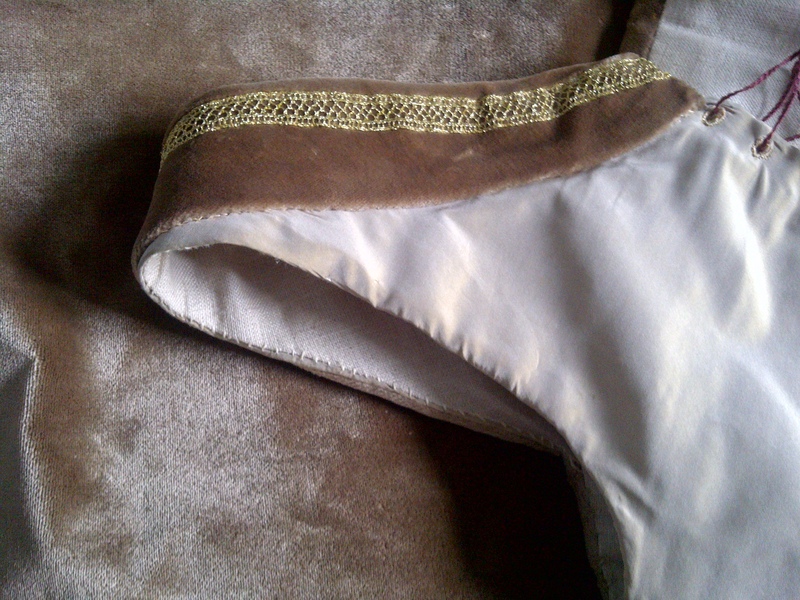 Leave a small opening at the back seam – or at the side seams if your bodice is side laced! 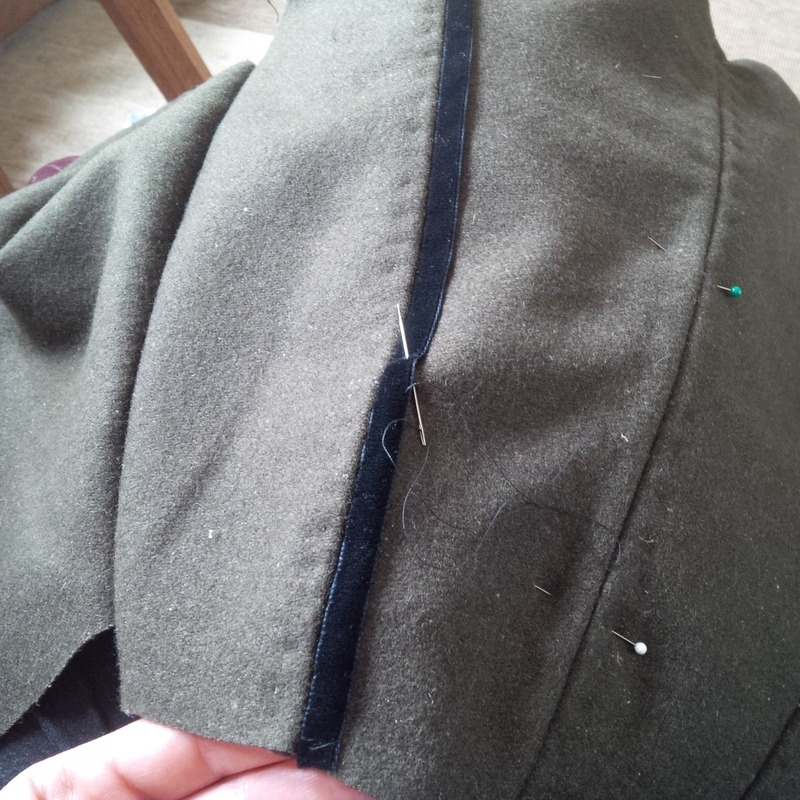 Do the same for lining, then insert the lining into the skirt and baste the layers together at the top. 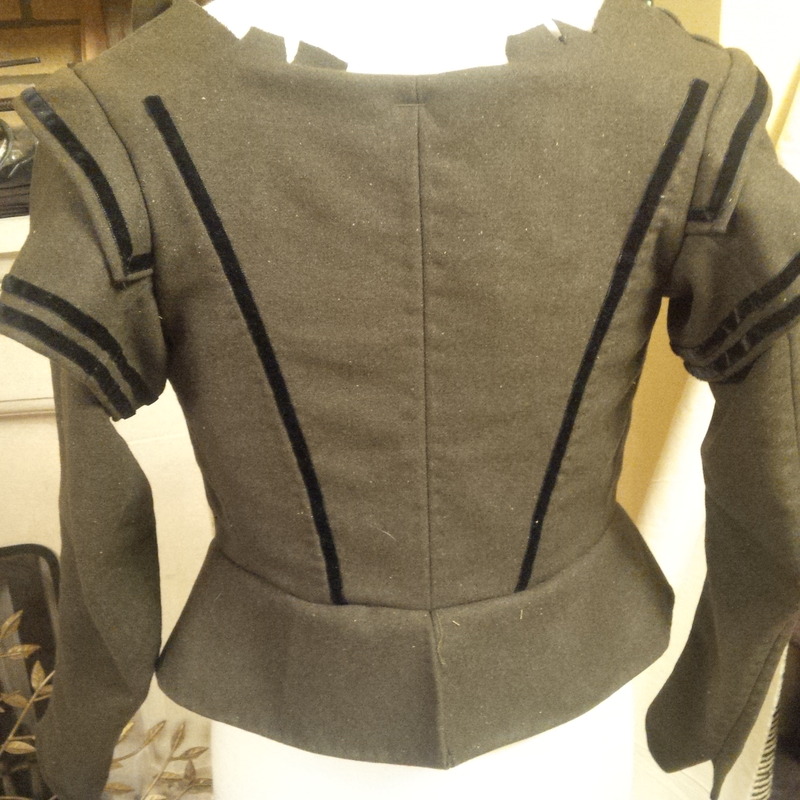 Arrange the pleats, pinning them firmly in place and pin the skirt to the bodice. 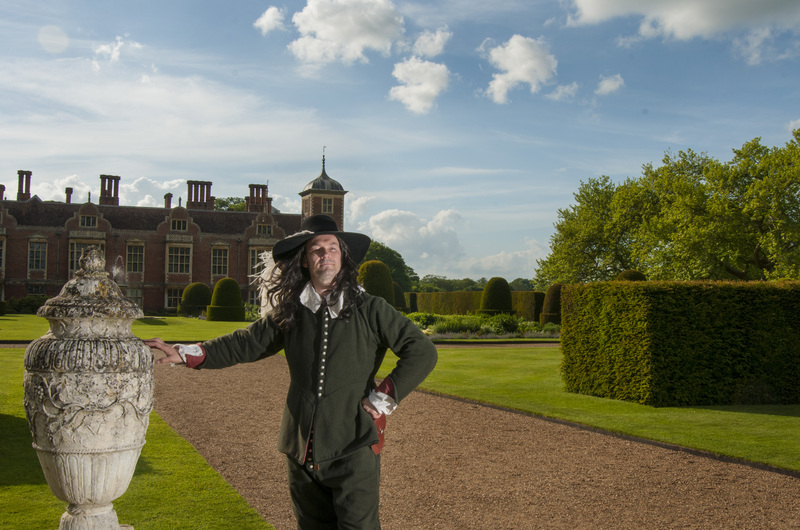 Try it on, wearing a farthingale if you plan to wear one. Be careful not to stitch the point at the front to the end – leave a small gap and finish it off later by hand, making sure the point is sharp and lies flat. Fold the bodice lining over the seam and sew. 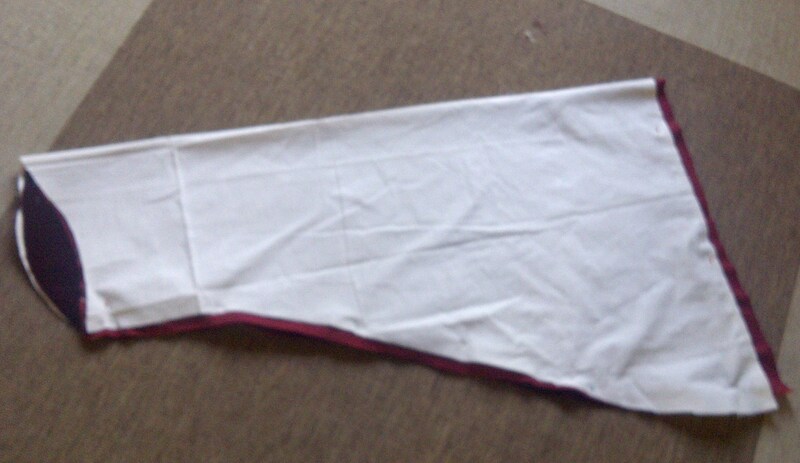 The bottom of the skirts can be either bound or unbound. For unbound finish, simply fold the top fabric under and hem, and then attach the lining with a slip stitch. For a bound finish, cut diagonal tapes of fabric or appropriate width – the binding or the guard, can be wider, as it protects the fabric of the skirt proper from damage and dirt. 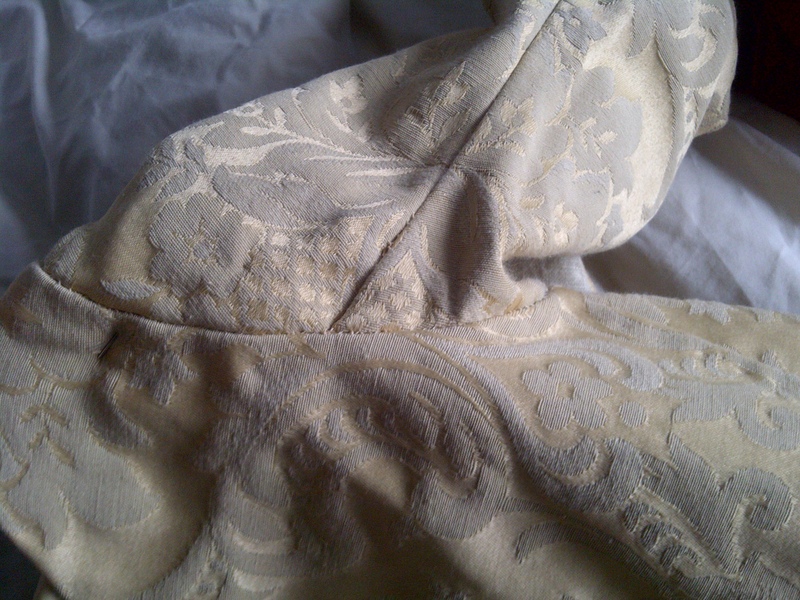 If the binding gets dirty and tattered in time, it can be removed and a new one sewn on. Bind the skirts, carefully enclosing the edges – the process is discussed in more detail when we focus on the binding of the gown skirts. 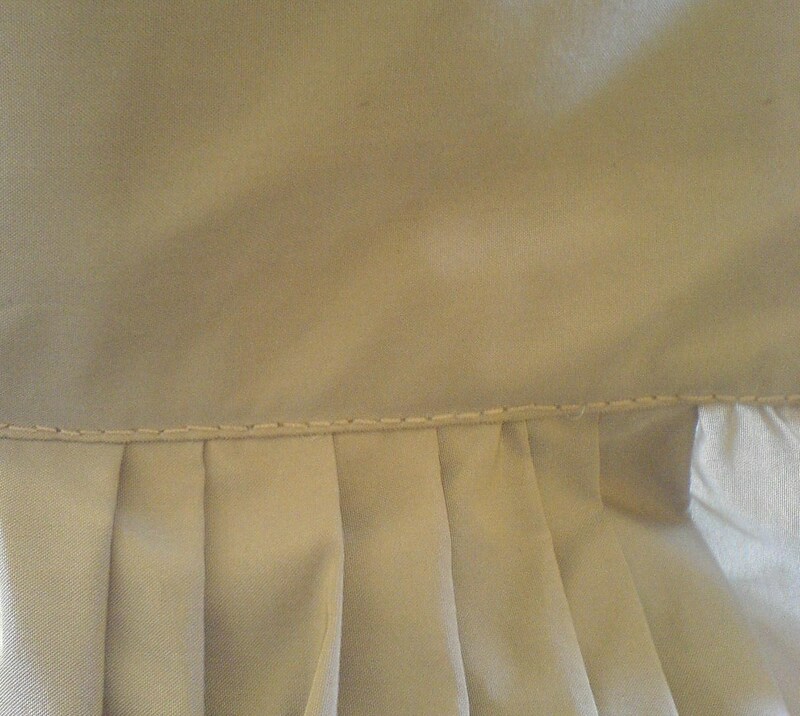 knife pleats of the skirts, attached to the bodice and additionally secured with top stitching. 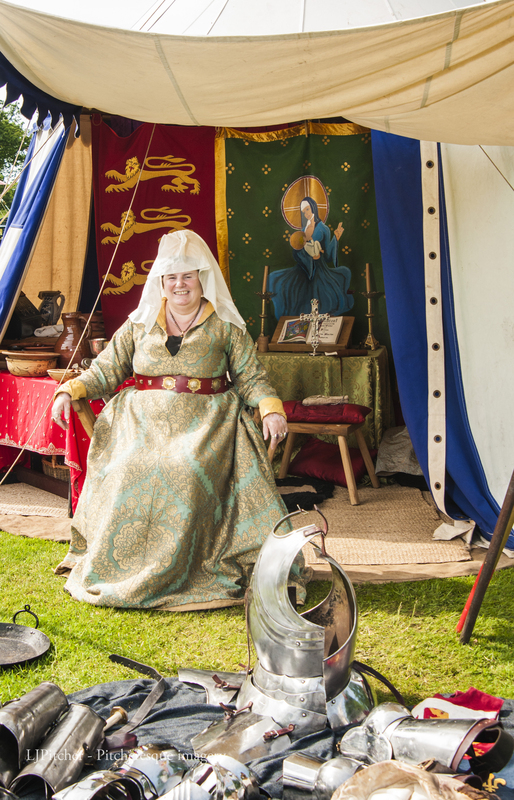 Your kirtle is now ready. The amount of fabric will depend on how wide your fabric is, how voluminous you want the skirts, how big the sleeves and how long a train, if any, you want your gown to have. 2-3 m of lining fabric for turn back sleeves, if you plan a more decorative finish – fur, velvet or different colour silk works well. As always cut the bodice pieces in calico only first. 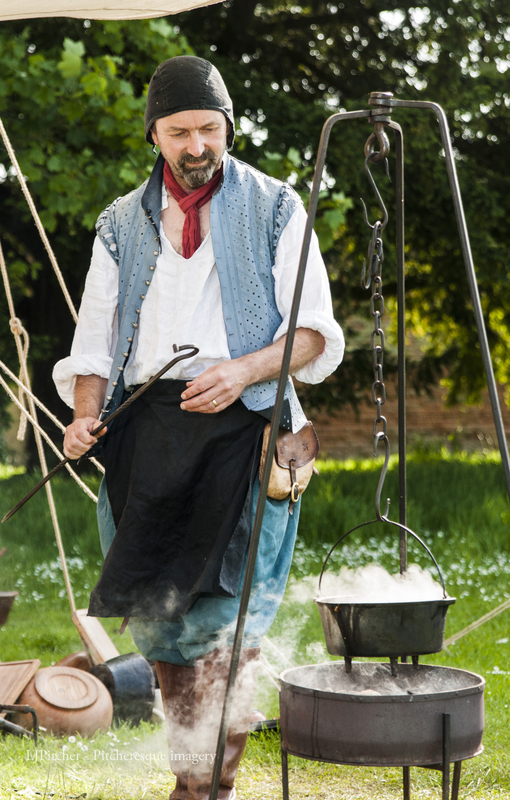 Baste together and try them on the kirtle. Adjust if necessary. 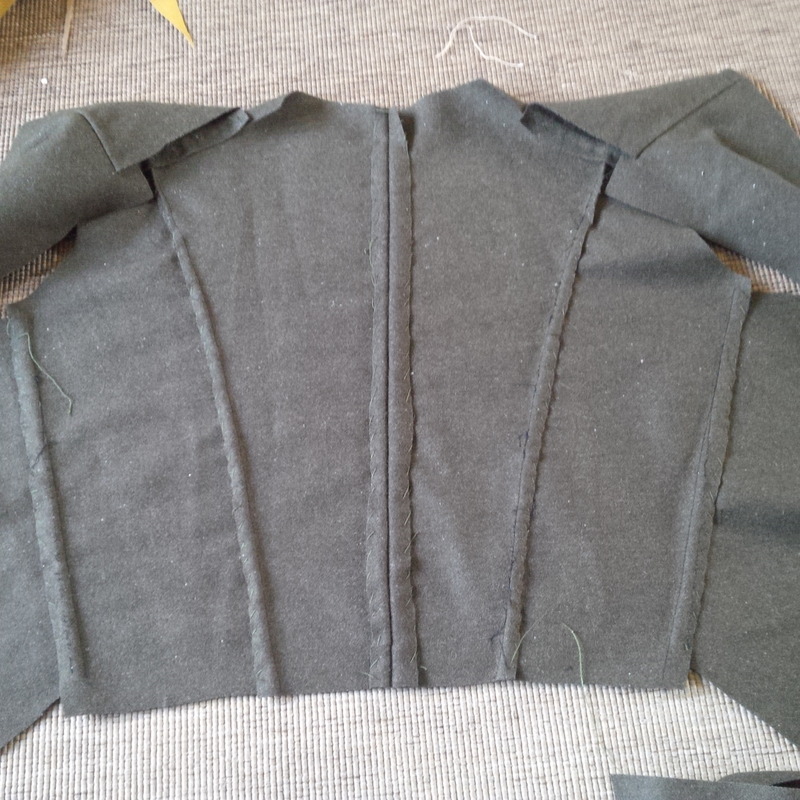 Cut the bodice pieces in top fabric, interlining and lining. 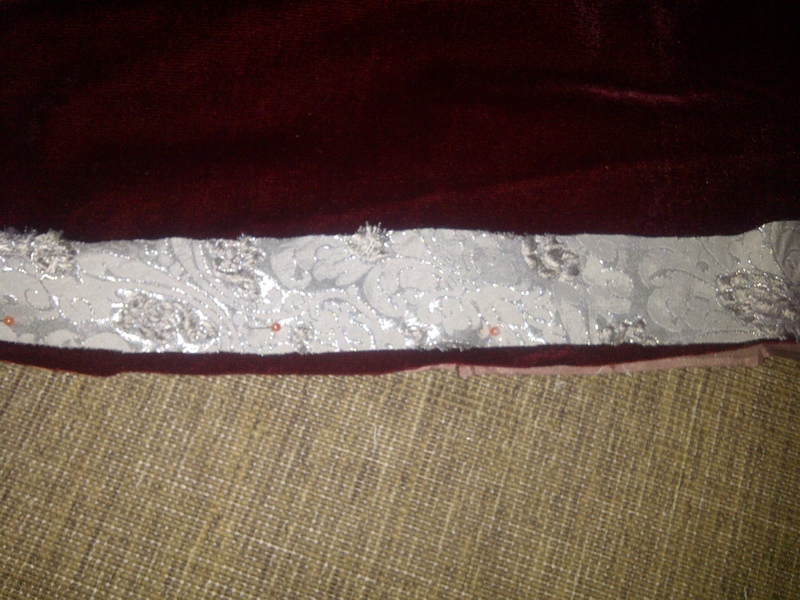 If you are working with slippery fabrics like silk velvet, it is a good idea to cut the interlining first and then the top fabric, pinning the interlining pieces to the left side of the velvet. If your fabric has a pattern, be careful to match it, if possible! Pin or baste the top fabric and interlining together. 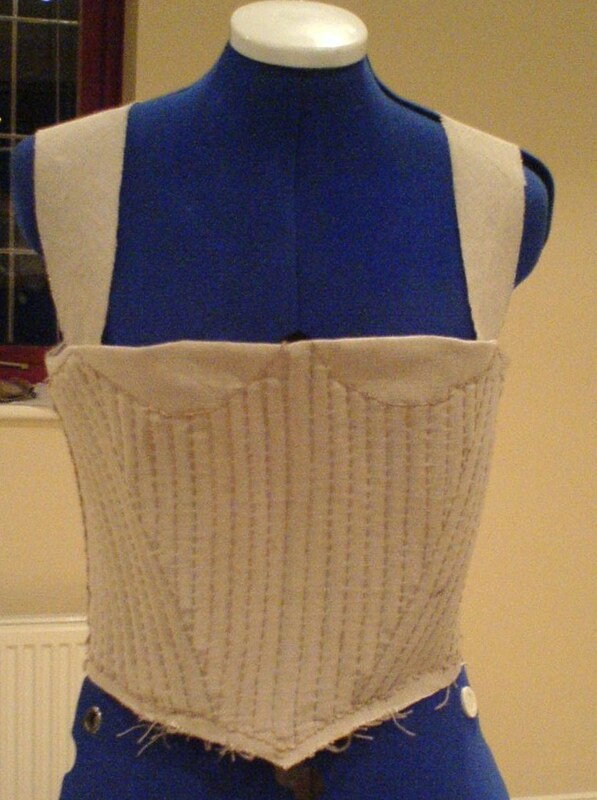 Start building your bodice from the back. Place the two back pieces right sides together and sew. If you are sewing by hand, backstitch works best – then fold the seam allowance twice, hiding the edges, and couch them down to the interlining. Whether sewing by hand or by machine, press the seams carefully. Repeat the steps for all the back and side pieces. The pieces in the very front, the forebodies, can be cut in a cheaper fabric as they will be completely hidden by the placard. Work on them first, before attaching them to the rest of the bodice. 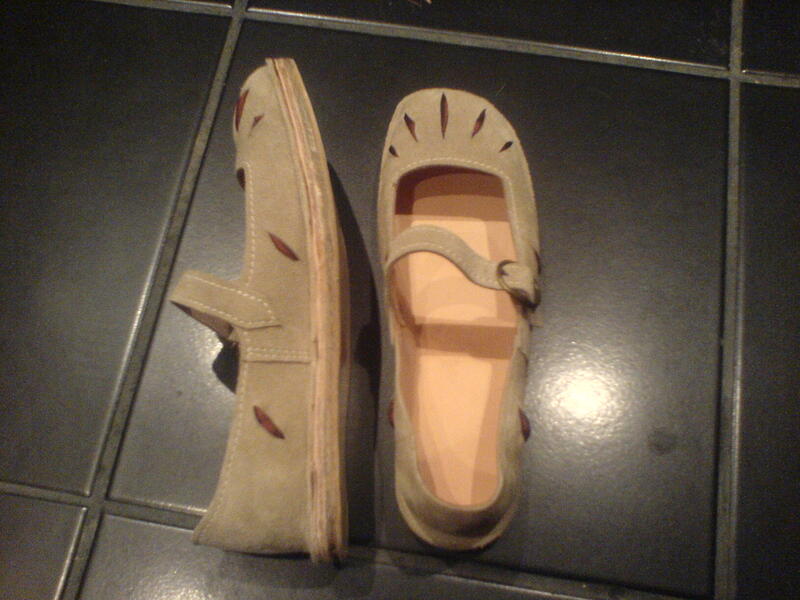 Cut them in lining, interlining and top fabric. Pin the interlining to the top fabric. Place the top fabric and lining right sides together and sew at the centre front line. Turn out and sew the boning channels. Fold the upper edges to the inside and stitch carefully. Bone the forebodies, and work eyelets. Attach the forebodies to the main bodice. Try the bodice on to make sure it fits correctly. Cut the sleeves in top fabric, lining and interlining. You may have to piece the sleeve if you don’t have enough decorative fabric to cover the entire sleeve. 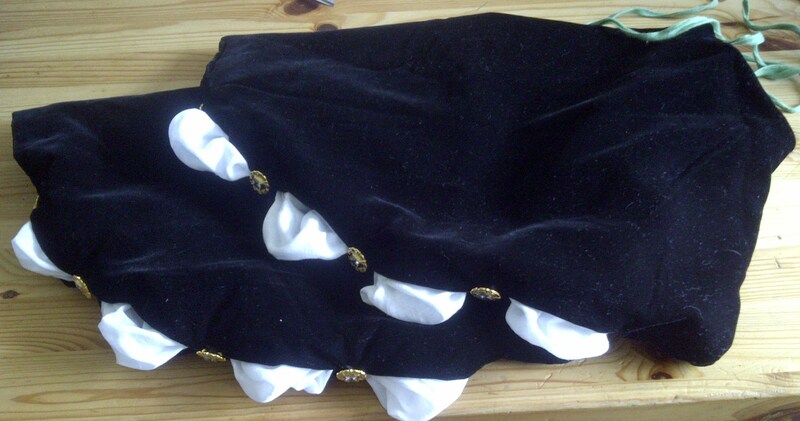 Decorative sleeve lining, made out of 4 pieces. 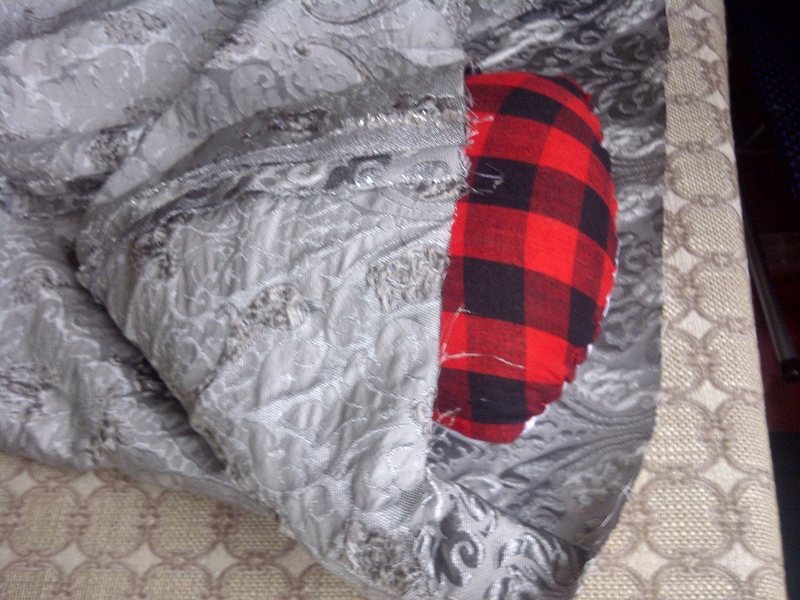 Baste or pin the top fabric and interlining together, fold and sew with right sides together. Turn right side out, fold the hem and stitch, securing the edge. Press the seams – for the curved seams use a tailoring ham. Pin the sleeve into the armhole and sew. Tidy the edges and notch the seam – it will work better and the seam will lay correctly, without stretching the fabric too much. Repeat the same steps for the lining, starting with the back and side pieces of the bodice and then inserting the sleeves. 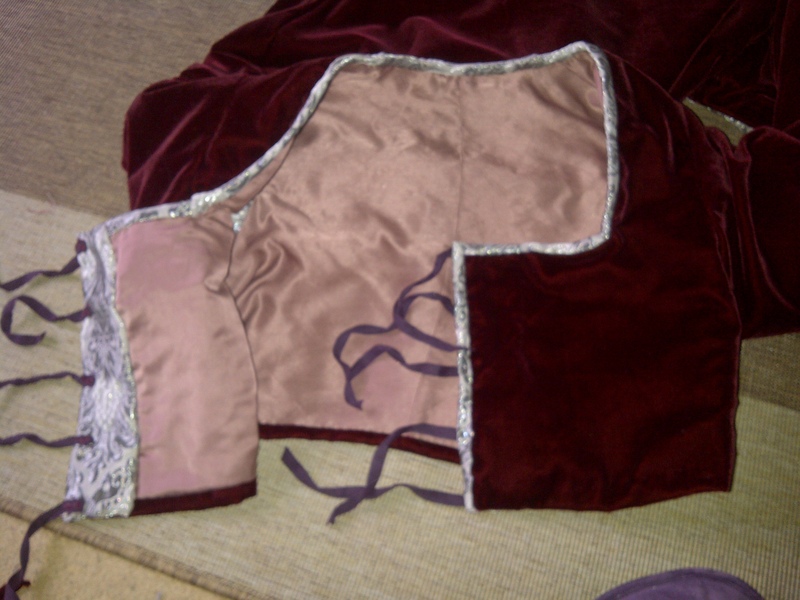 Set the lining into the bodice, sewing with a slip stitch. For an earlier style, you can bind the edges in contrasting fabric – it works especially well for the bodice with ties. 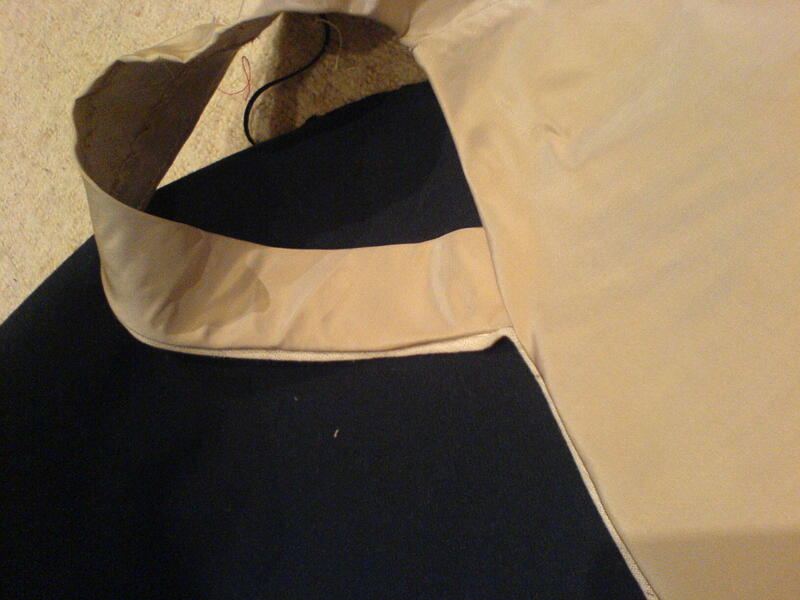 Finish the sleeves as well – slipstitching the lining top the folded hems of the sleeves. Your bodice is now ready. 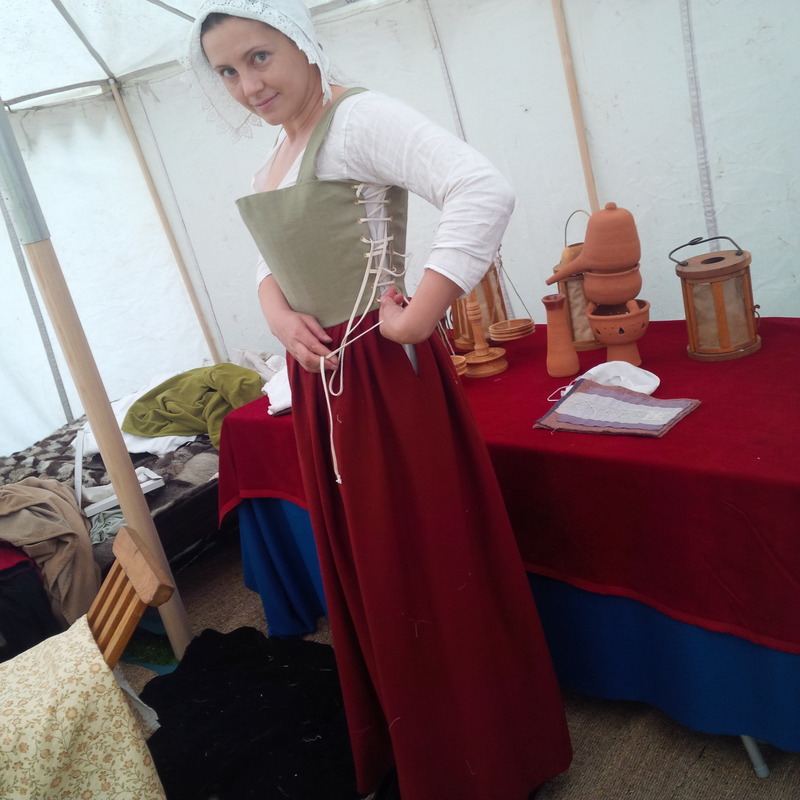 Do try it on the kirtle again, making sure that the waist line is in correct place and that the sleeves lie correctly. 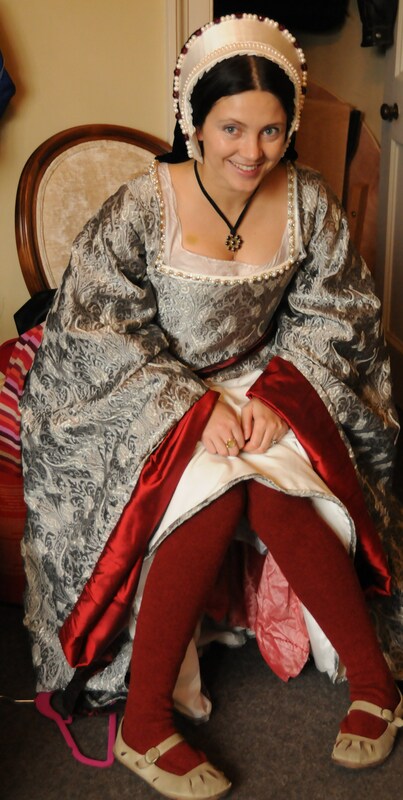 A bodice of the gown over a kirtle in gold. 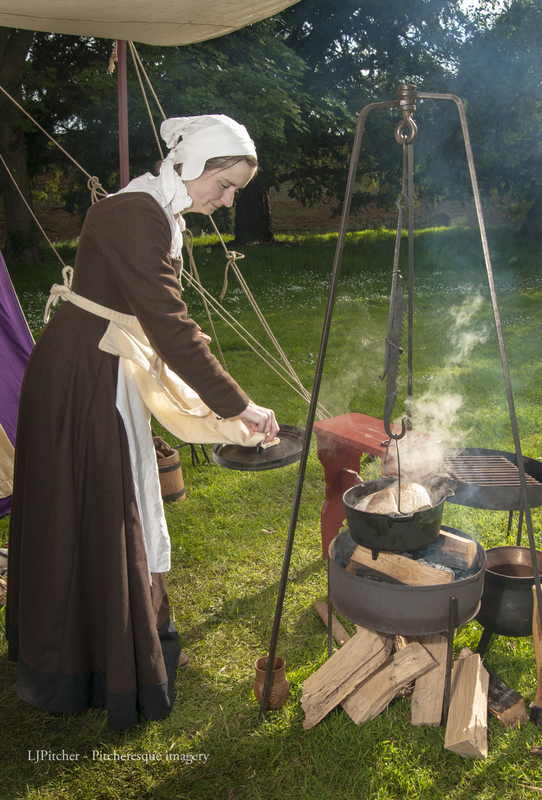 Making of the skirts is very similar to the kirtle skirts. Cut the pieces in top fabric, interlining and lining. Baste the interlining and top fabric pieces together, and sew – it is often easier to start with the back pieces. 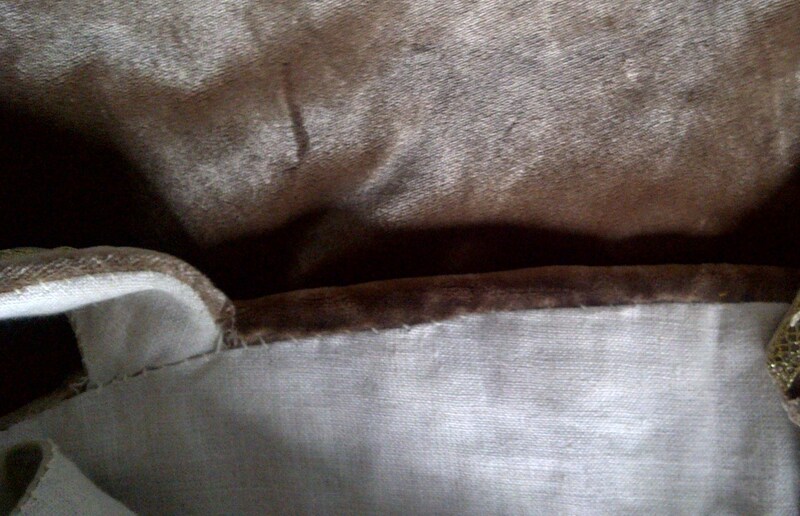 Place the lining right sides together, on the top fabric. Pin at the top and sew. Turn over and press the seams. Fold again, this time left sides together and press. 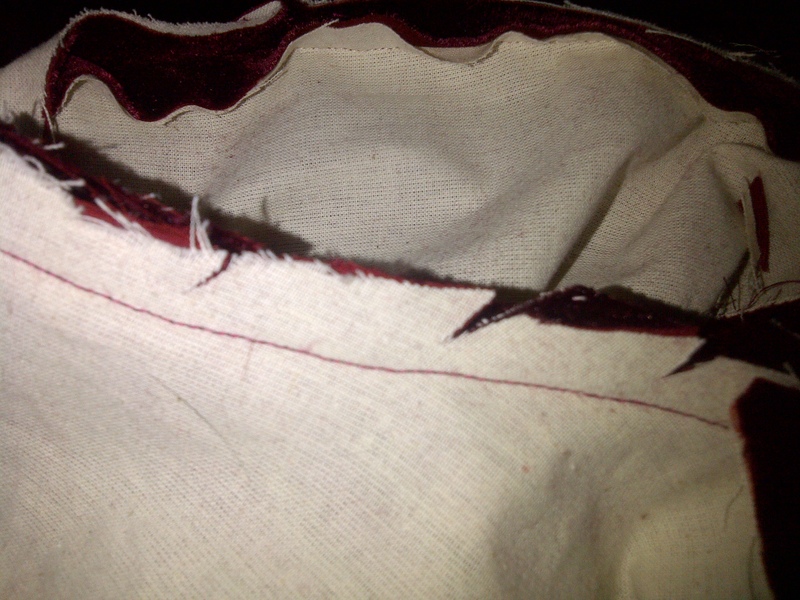 If necessary, sew with a running stitch at the edge, just to make sure the edge is firm and even. At that stage, especially if you are using silk velvet, hang your skirts for a few hours, allowing the fabrics to stretch. If you are finishing the skirts without binding, fold the top fabric and stitch it down. 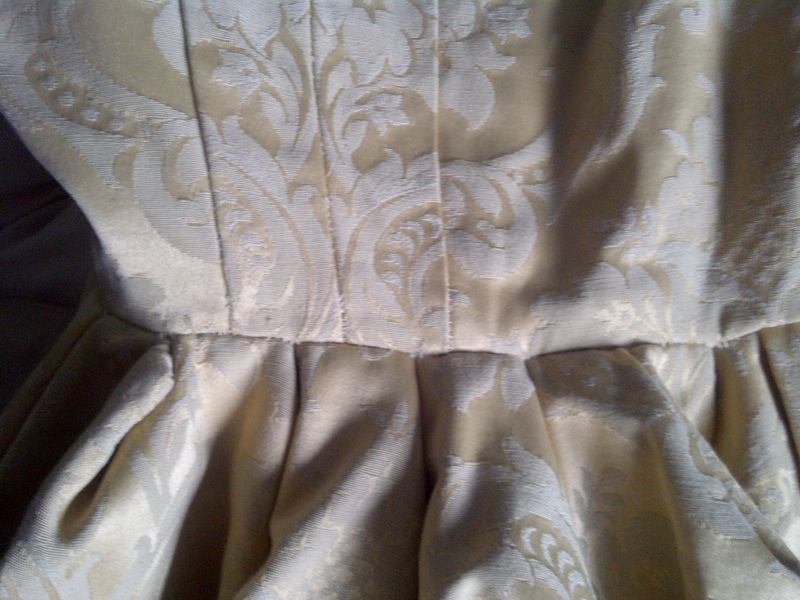 Pin in the skirts on a dummy, on the farthingale, if you plan to use one and check if the hem is even, and pin the lining to the top fabric, making sure the lining is not too long and does not sag below the hem. Fold the edge of the lining and slip stitch. It is actually easier to do that while the skirts are still on the dummy! If you are binding the skirts, there is no need to hem the top layer. Simply pin the three layers together at the bottom – again, working on the dummy makes it easier. Take the skirts of and lay it on a flat surface. Tidy the edges. Pin your binding fabric onto the skirts; the pins should go through all three layers. Sew along the edge all around the skirt’s hem. Tidy the edges so that they are even. Unfold the binding and press. 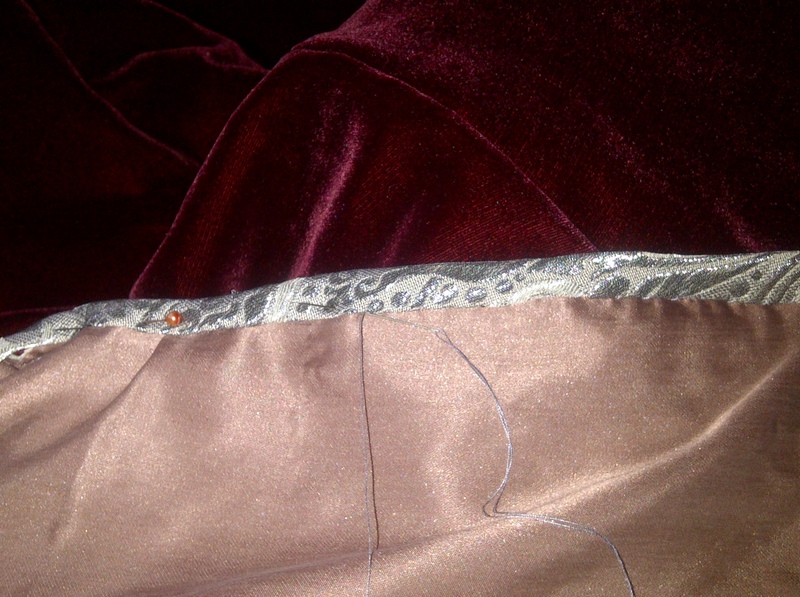 Bring the binding over the hem, fold it and pin, so that it completely encloses the edges. Slipstitch with a matching thread. Your hem is now bound! You can repeat the same steps on the front edges of the open skirts – here, since the line is straight and not curved as in the case of the trained skirt, the binding cut on the straight grain, not on the bias, works better. 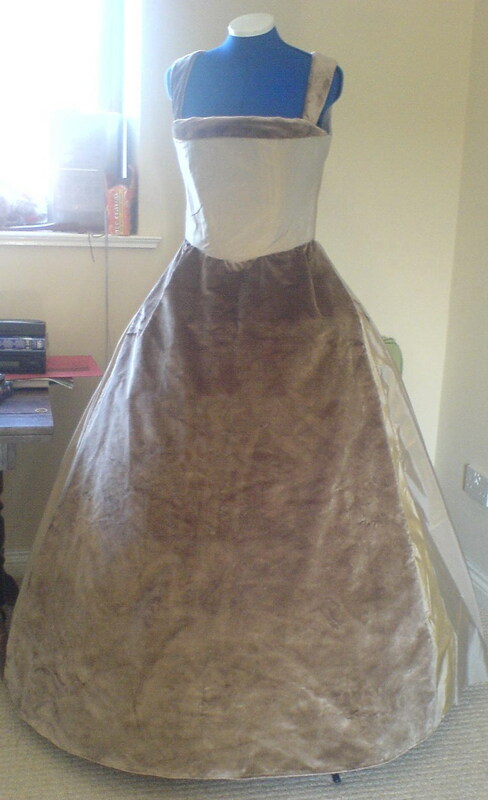 All you need to do now is to pleat the skirts and attach them to the bodice. You can use either box pleats or cartridge pleats, or combination of knife and cartridge pleats. For box pleats, more suitable for the earlier gowns with closed front, simply arrange the pleats, pin together and sew together. 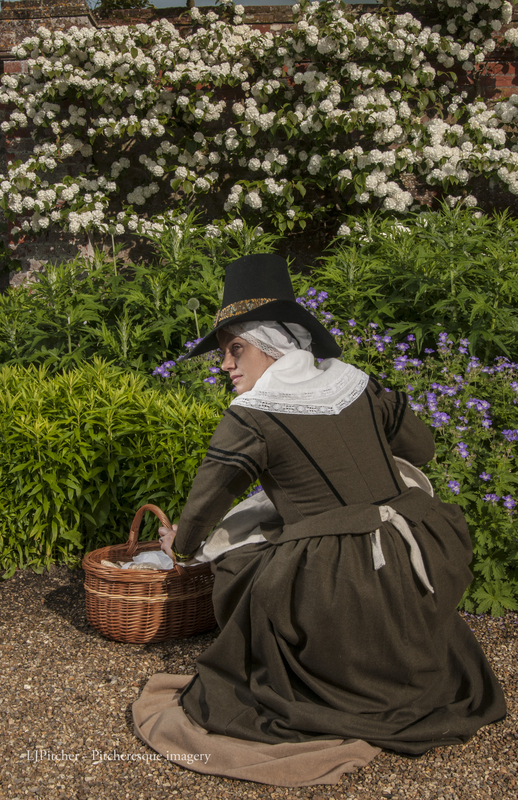 You can also stuff the pleats with woolen waddling, a technique described in The Queen’s Servants book. It provided the back of the skirts with more volume, achieving the fashionable look depicted in the famous Holbain sketch. Alternatively, for open fronted gowns, a mixture of knife and cartridge pleats works better. Arrange the front parts of the skirts into a few deep knife pleats, and leave the back section to be pleated into large cartridge pleats there. 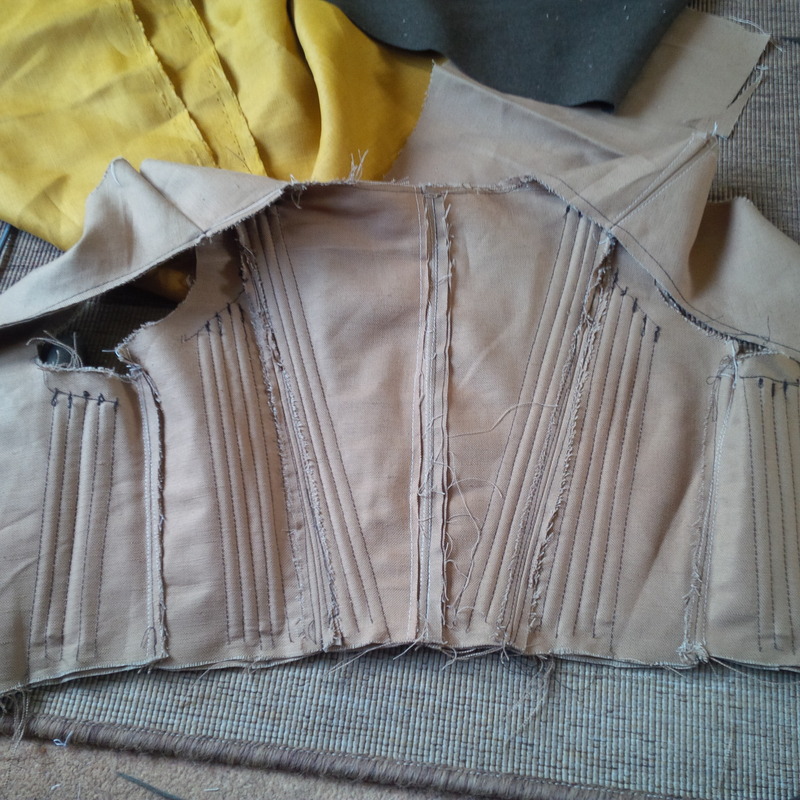 Before stitching the pleats, try the pleated skirts on the dummy – with the farthingale, making sure that they fall gracefully. 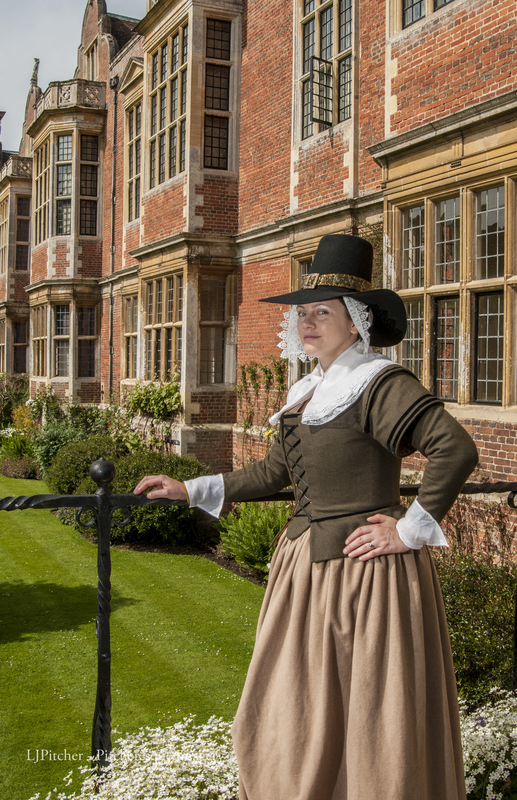 Skirts with pinned pleats – the first knife pleats work better on farthingale if they are deep. Place the bodice and pleated skirts right sides together, and whipstitch them together. All that remains for the gown to be ready is a placard. Cut the pieces in interlining (2 layers, light buckram works well, plus one layer of linen or calico if your top fabric is flimsy), lining and top fabric. Place the two layers of interlining together and run a channel for a bone at the centre front. It always work well to run bigger channels across the whole width of the placard as this will stiffen the fabrics even more , even if you do not place the boning inside. Place the buckram layers on the left side of the fop fabric (with interlining if necessary). Fold the top fabric edged down and stitch, securing it to the base. Line the placard with the last piece. 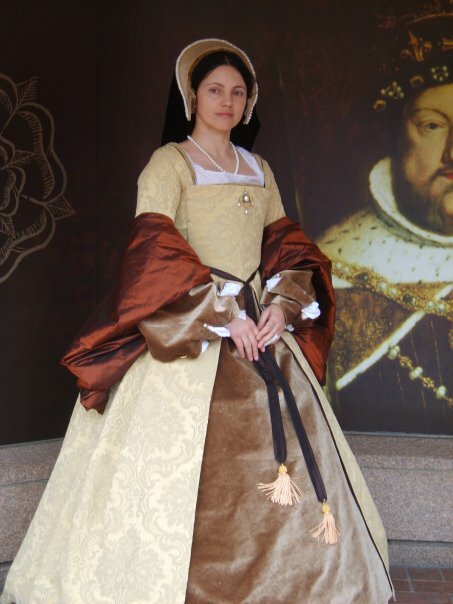 The placard will be pinned to the bodice using pins – a method evident from a few portraits from the era, the most famous one being the one of Jane Seymour, by Hans Holbein. Pinning the bodice works well as it is possible to adapt the size of the gown with the lacing and removable placard – important for example in case of pregnancy. 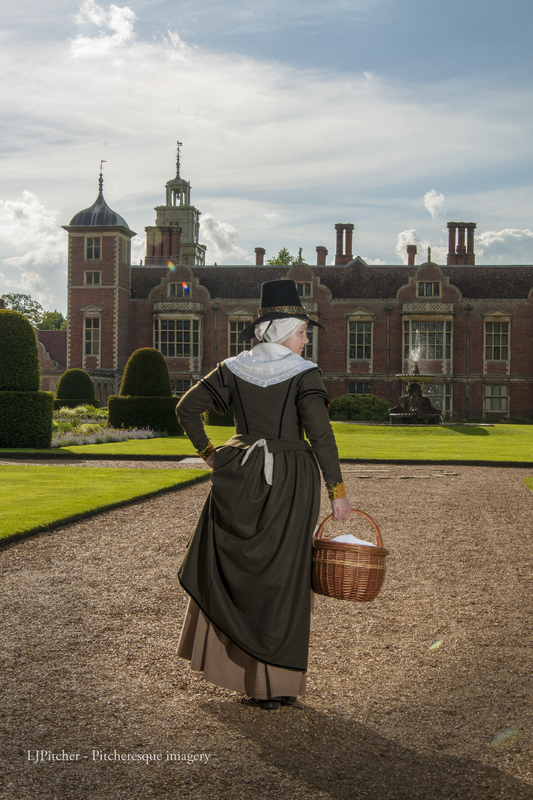 It is a painful and lengthy process however, often requiring the help of a maid, and many re-enactors and actors often resort to sewing one side of the placard to the bodice and pinning only one side. Alternatively, it is possible to discard the pins altogether and used hooks and eyes – but that method obviously does not allow for size fluctuations! 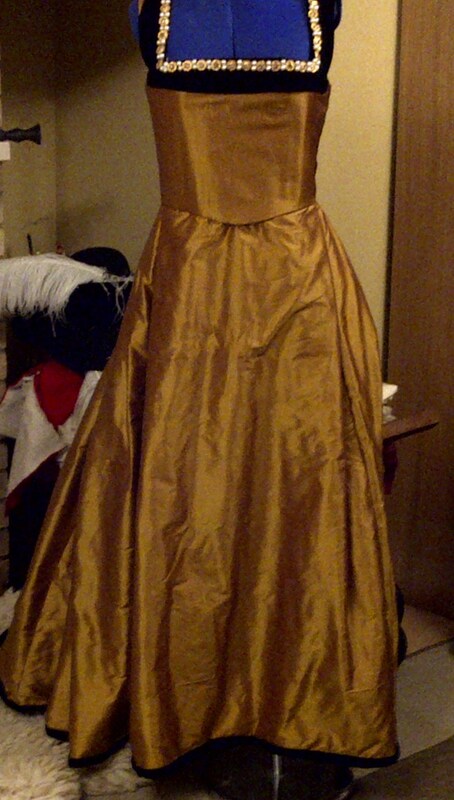 The gown is now ready, but it still needs accessories. 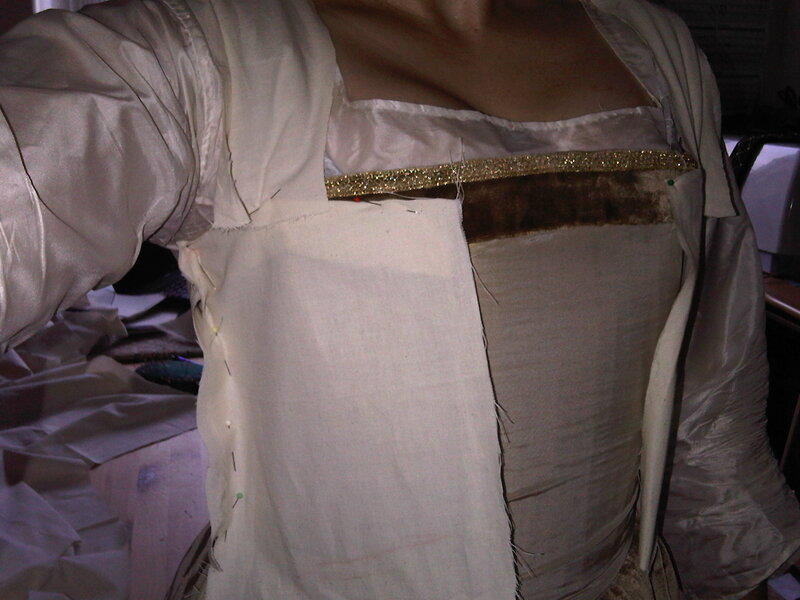 Linen tapes or braid for attaching the sleeves to the gown. 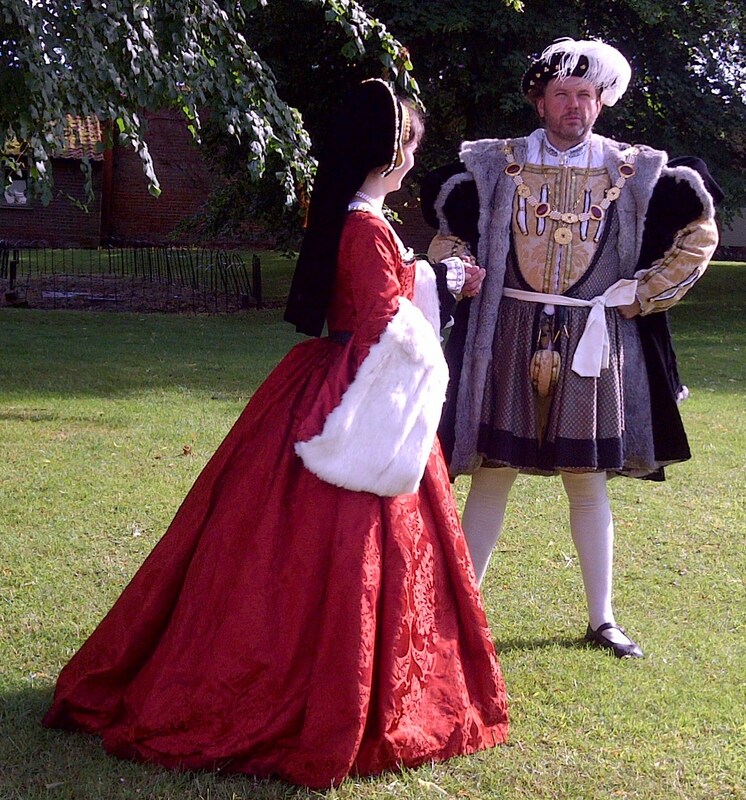 There are excellent instructions on how to make the sleeves to be found online, again, curtsey of The Tudor Tailor. Attach the ties to the sleeves, and to the inside of the gown’s sleeves. For a complete look you will also need cuffs. Cuffs can be a part of a smock, but can also be made separately so that they can be changed and washed separately from the smock. 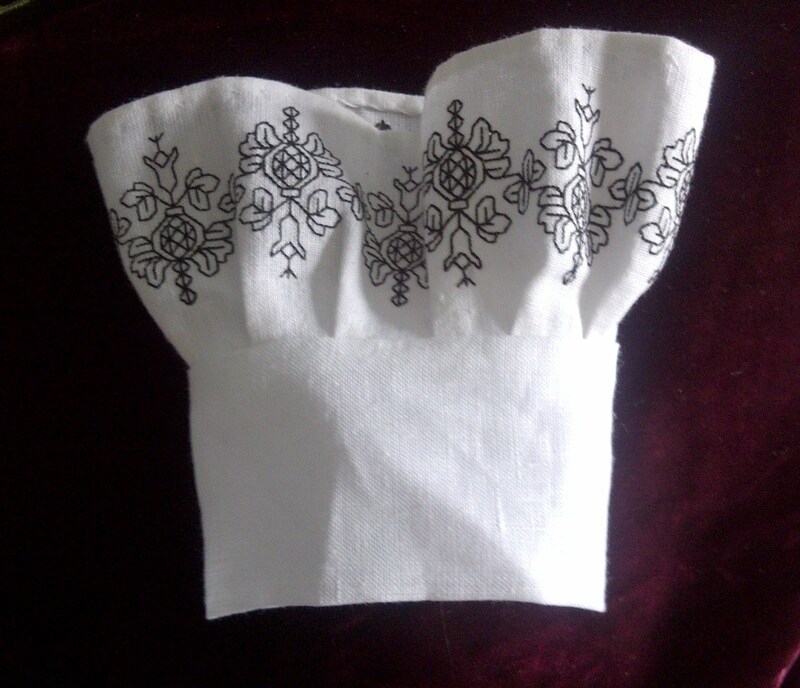 They were often embroidered with blackwork or redwork. They can close with buttons, hooks and eyes or can just be pinned together. 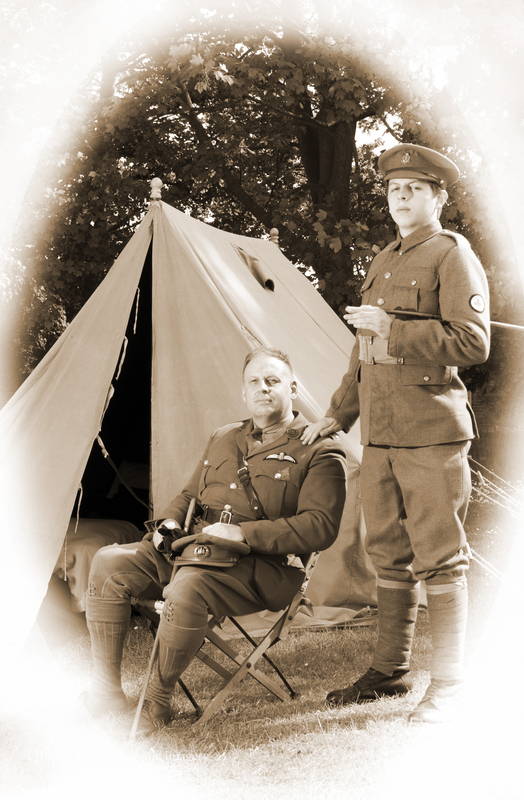 These were embroidered with black silks by Embroidery Emporium. All you need is a length of fabric- taffeta, velvet or satin. Fold the fabric in half, lengthwise, right sides together, and sew. 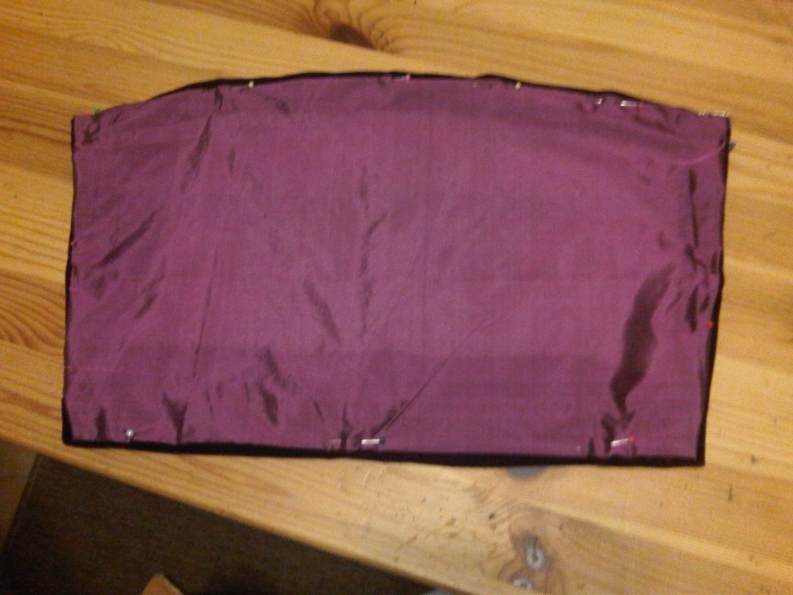 Turn right sides out; secure the ends by folding them in and stitching. 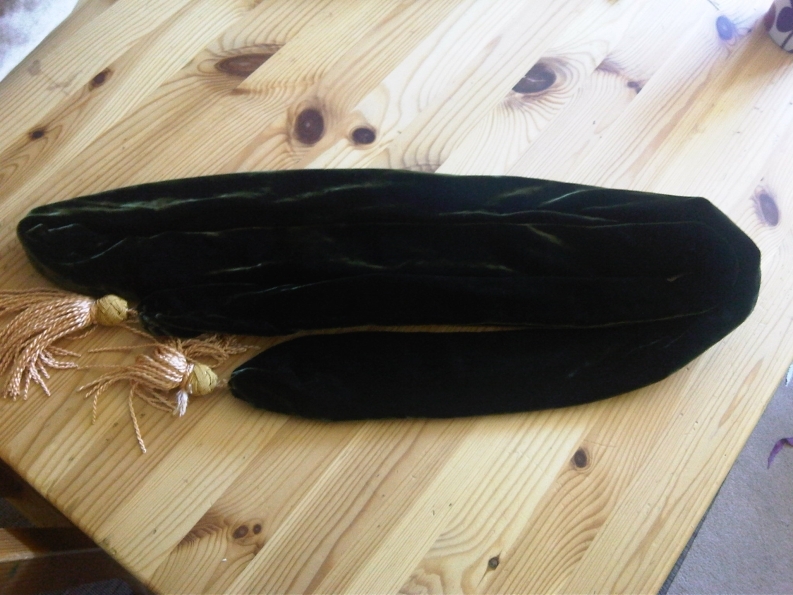 You can tie a knot at the ends, sew tassels or hang a pomander. And a French or English hood and you are ready! Mikhaila, Ninya and Malcolm-Davies, Jane. 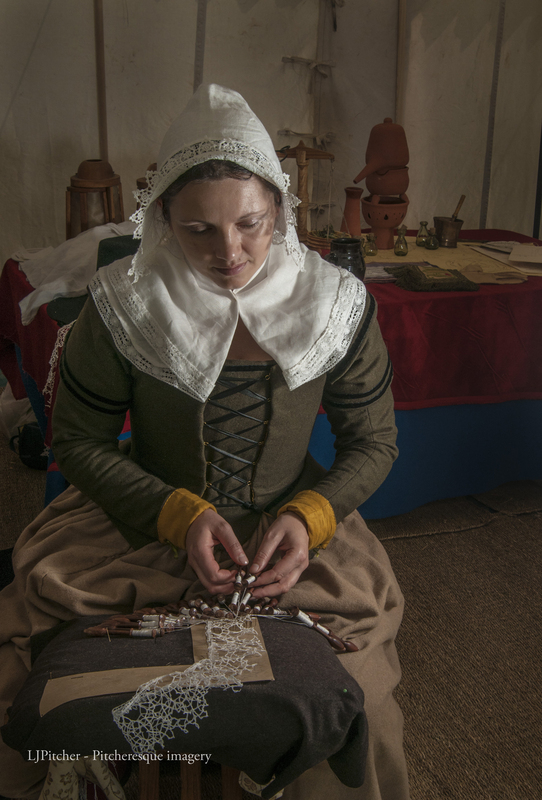 The Tudor Tailor: Reconstructing sixteenth–century dress. London: Batsford, 2006. Hayward, Maria. 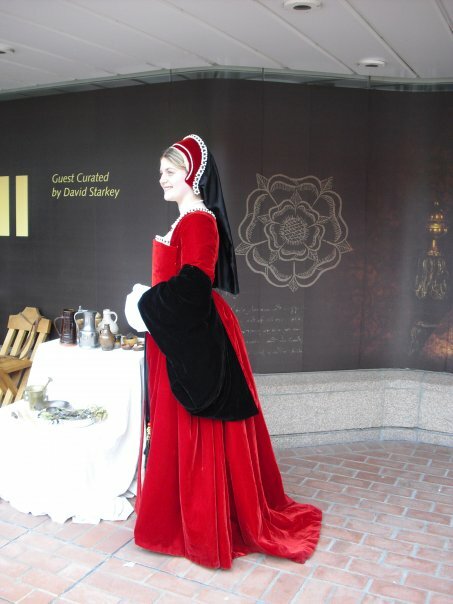 Dress at the Court of King Henry VIII. Leeds: Maney, 2007.